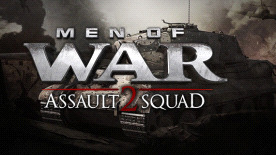 Men of War: Assault Squad 2 features new single player style skirmish modes that take players from extreme tank combat to deadly sniper stealth missions. Commanders can now faceoff against opponents on various new multiplayer 1v1 – 4v4 maps. To truly bring the battles to life though there is the new 8v8 game mode designed for huge battles on spectacular maps. This new Assault Squad game brings significant game engine and visual improvements as well, with special attention paid to ones that were highly requested by the players. These included items such as advanced multi-core support, advanced shader technology, interface and AI improvements, as well as added camouflage depending on season/map, fully updated inventory items with new graphics and updated vehicles, sound improvements, Steam multiplayer and much more.